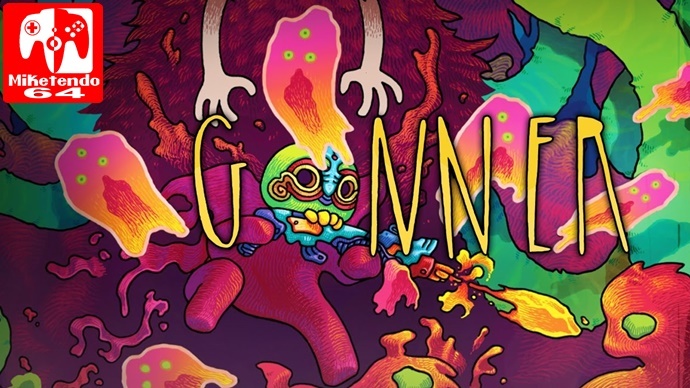 Created by Art in Heart and published by Raw Fury, GoNNER is a weird yet funky game. You play a generic blob with arms and legs called Ikk that has to blast its way through hordes of strange creatures whilst collecting weapons and power ups which can stop enemies for a short period of time, recharge your ammo and other skills, just so you can navigate your way through an organic world in order to find your friend Sally the space whale. Raw Fury is an indepent publishing company that helps talented indie gave developers with great potenial games, get them to wider audiences. Art in Heart is run by the one man band that goes by the name of Ditto. Originally brought to Steam in 2016, Raw Fury were given an opportunity to bring the game to Nintendo’s Next gen console, the Switch. When the Big N themselves approached them. The basic aim of the game is the try and rack up a better score than your friends which will be added to online leaderboards. The roguelike elements of GoNNER helps to keep the game fresh by procedurely regenerating levels and enemies so that no playthrough is the same twice. Simple in design yet chaotic in nature, navigating your way through each level can be quite a challenge, and yet is still compelling, urging you to do better the next time around. The levels don’t fully reveal themselves to you straight away and there could be platforms or obstacles nearby that you can’t see until you are close to them which adds to the element of surprise. What is most surprising is how the different levels are divided, instead of wallking through a door or a tunnel, you get eaten by a snake like creature and excreted out the other end, lovely! You can also double jump on in mid air or even hop off of walls multiple times to reach the top or to get above an awkward enemy. The background music has an underground techno theme to it that makes you feel like you have walked into some kind of 90’s alternative rave party. After several playthroughs, you will acquire different weapons and heads that can give you a better advantage on your next playthrough. You will be allowed to choose between them at the beginning of the game before you actually head on to kill enemies. The weapons can range from machine to bazooka and the different heads give you a set amount of health. If you lose your head, you will lose a life and if you lose all your lives, it’s game over. There are secret areas in the game where you can exchange ingame currency for weapons and heads. It doesn’t quite make sense how much is each item cost but you never keep hold of it for long anyway as you will most likely die. Alongside the main game, there are daily challenges which allows players to compete for the highest score on the same generated level for that day. The scores are then added to the Leaderboard depending on how well you did. The controls are simplistic enough requiring the use of only 5 buttons or so, A to jump, B to accept, X To fire and ZL to use abilities and the Joy stick to move. It is one of those games that is easy enough to learn but will surely take time to master as you have to be quickly adaptable to take on the randomness of what is to come as the levels can change everytime. The game is interesting enough as it is but there is not enough meat on the bones to want to sink hours into, it is more of a ‘Every now and again’ kind of game. Which kind of works well with the Switch because you can pick it up to play and then leave it as and when you have free time. It’s simple charm warrants more possibilities to play it but there will be time lapses in between. For only $9.99 you can’t go too wrong with this game, its not going to break the bank and it is still fun to come back to every now and again. The sound effects are funky, the gameplay is challenging yet addictive and the final scene of being reunited with Sally The Space Whale is endearing.